James Thomas Nickerson, the third of five children, was born April 3, 1928 in Ozark, Alabama to the late Mr. And Mrs. Homer and Miley Nickerson. One sister, Doshia Jackson, and two brothers, Benjamin and Milton Nickerson preceded him in death. James Thomas served his country in the United States Army during the Korean War and with service in Germany. He was discharged from the Army in 1953 and returned home to be united in holy matrimony to Annie Mertha Snell, the love of his life, on December 26, 1953. Annie Mertha preceded him in death on October 5, 2010. To this union two loving daughters were born, Angela Diann and Katha Ann. 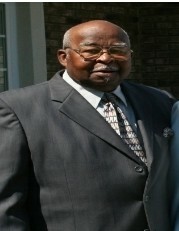 He is survived by two loving daughters, Angela Diann (David) Hood of Tuscaloosa, AL and Katha Ann Nickerson of Enterprise, AL; one brother, Walter (Linda) Nickerson of Huntsville, AL; three grandchildren, Roderick (Angela)Prince of Grovetown, GA; Rori Prince of Tuscaloosa, AL, and Kamesha (Fernando) Tomlinson of Evans, GA; three great-grandchildren, Kamora Tomlinson of Evans, GA; Kameron Tomlinson of Evans, GA; Emery Spencer of Tuscaloosa, AL; three step great-grandchildren Tiana Roberts, Maia Jones and Angel Smith all of Grovetown, GA; God-children, Kenneth (Blonzell) Smith of Dothan, AL; Craig Smith of Birmingham, AL and Michelle Smith of Enterprise, AL; two sister-in-laws, Catherine Walker and Carolyn Nickerson both of Saginaw, MI; and a host of many special family members, church family, neighbors and friends.